Please see the header on the Example (click here) deck. All submissions should include the header at the TOP of your report found in the example mentioned above, which includes: Deck Name, Your Name, City and State of tournament. Also include the Date of the tournament in your header, and it's great if you include the # of people that participated. This gives your report some respect. Be honest. 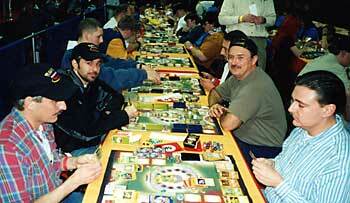 Tourneys at friends houses do not count as a large-scale tourney, as the world at large is usually not invited. List all 60 cards in your deck and tell us the tournament results. We've said this many a time ... even if your deck does bad .. write a detailed report if you want, everyone will still learn from it, and may recommend good changes for you. Try to tell us the types of decks you faced each round. Simply saying, "I won" each round, or even worse, saying things like "my deck just dominated all day" instead of giving details is a sure way for your report to NOT get posted. The deck name & your name should be listed in the subject line of your email. Did you use someone else's deck previously listed in Killer Decks in the tourney? If so, tell us who's deck it was. How did it do? We will post your results right under that existing deck. Provide your name & e-mail address at the bottom of your report, so other readers can contact you. We will not post your deck if you do not include your email address. Let people contact you directly. If the tournament you played in allowed Japanese cards not printed in English, you must provide a translation for the card in your report. Do not use all capital letters in your report. Yes, I know sometimes you need to put a word, or even an entire sentence in all caps to signify it being important, but if you entire deck listing or entire report is all caps, it will be discarded. Reports that do not meet the above Requirements are simply deleted. We apologize if we hurt your feelings, but with the quantity of email we get, we had to set some very high standards to keep our site top notch. Thanks!!!! Submit your report to PoJo. Do not click here to submit a deck for the Deck Garage. Your Deck Garage submission will be deleted if sent here. We have always been thankful for each and every submittal we have received! !